This is a great question that we hear all the time in the clinic and the answer is yes ! Just like humans, our pets can experience the discomfort of allergies. From food to seasonal allergies here are some common symptoms to watch for and what to expect when you come for a visit regarding possible allergies. I think my pet has allergies, what happens now? The first step in treating pet allergies is a trip to our clinic. Our Veterinarian will do a full exam and thoroughly go over your questions and concerns. Depending on the severity and type of symptoms that your pet is showing, the Veterinarian will make several suggestions to you based on your individual pet. This may range from a food trial, to prescription medication, or even allergy testing. 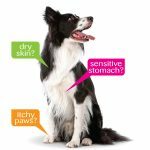 We will work with you to find the best solution to your pets allergy symptoms! If you have questions regarding allergies or for an appointment, please feel free to contact us!